MyUW has been a pillar of University web resources since its initial launch in 2000. Whether you just sign in to use the quick links to your email or Canvas, or use MyClass resources daily when teaching a course, MyUW is an important part of the work routine for many students, employees and instructors. However, the time has come for the old MyUW to take its well earned retirement. Reluctant as we are to say goodbye, the time has come to revolutionize MyUW, a decision based upon the changing expectations of users and the evolution of Internet technologies. The old MyUW just doesn’t fit the way people use web resources anymore. In 2000, Internet search was not as robust as it has now become. Google.com was less than two years old when MyUW was launched. The creators of MyUW had a clear goal. They recognized that many useful resources for students and employees were available on the UW intranet, but that people had difficulty finding them. MyUW was built to provide a single entry point to multiple services, freeing people from having to navigate to (and remember how to find) important resources. From MyUW’s inception, personalization was a priority. Even the first users of MyUW saw resources based on their affiliation with the University (e.g., student, instructor, staff, alumni). However, technical limitations created challenges for groups that fed data to MyUW. In the absence of APIs, data providers had to find whatever way they could to share their data with MyUW, such as through daily data feeds or sharing files. Not only personalization, but customization was a feature of the early MyUW. One method of “customization” was to collect and save bookmarks in MyUW. That early practice has given way to a reliance on powerful search engines. We also expect modern web applications to be “smarter.” Instead of wading through information, we want websites to show us useful and relevant information based on known data about us. The new MyUW strives to meet these new user expectations. Below is a brief overview of the journey we took to get here. We began addressing this changing online landscape in 2011, when the MyUW team undertook a formal user research study with students, as part of an initiative sponsored by the Office of the Provost on improving the student experience. We conducted focus groups with students to understand how they used the legacy MyUW, what problems they encountered, and what they wished it would do better. Among other things, we learned that it took nearly two years for students to get comfortable using the (legacy) MyUW. Students described the experience of information overload when trying to use MyUW, overwhelmed by the sheer number of links available on the front page. Not until junior year did students figure out how to find the particular information they needed at any given moment during the academic quarter. This was a shocking and somewhat disheartening discovery! Another significant discovery was the fact that MyUW visitors relied extensively upon search because they couldn’t find what they were looking for — even though it was all there on the page. Subsequent user research helped us to develop the vision and value statement for the new MyUW. We conducted a survey that asked students to prioritize new and existing features for MyUW, to help us understand what they valued most. We also conducted an innovative diary study that aimed to understand students’ quarterly workflow and their goals for each year. In this study, students logged their activities several times a day for three weeks, including the websites or tools they encountered; successive groups of students participated throughout an entire quarter. This study helped us to better understand what students were trying to accomplish over the course of a quarter and revealed a predictable quarterly pattern. The new MyUW vision: to provide personal, timely, relevant information and resources to help users conduct their work with the University. The new MyUW strives to provide actionable information and direct users to the tools they need to continue their work. These new insights helped us form a thoughtful mission and strategy for building a new MyUW. We began first by creating a mobile version of MyUW, due to increasing usage of mobile devices and prioritization of mobile access by students. The mobile version focused on supporting the quarterly timeline of students, promoting personal, relevant, timely information that students need to complete tasks at various points over the course of the quarter. The goal was to feature information that would trigger actions students could take at a specific point in time. Rather than academic tasks, these actions mostly focused on a student’s business engagement with the University (e.g., meeting deadlines for financial aid). The mobile version also allows students to follow links to do further work in other systems (e.g., MyPlan). The first mobile app was released in 2013. We iterated on that first release, adding additional features and content, until it developed into a fully-featured version for mobile and desktop use that was a replacement of the legacy MyUW for students. This responsive version for students was released in 2015. As the new desktop version of MyUW was being released, we were now conducting user research with instructors, another group that relies heavily on MyUW. As with students, we learned that instructors’ quarterly work and goals follow a predictable progression, so our focus for building a MyUW for instructors has been to support their quarterly workflow — first preparation of a course, then facilitation throughout the quarter, and ending with grading. In July 2017 we released the new MyUW to instructors; this includes a summary teaching schedule on the home page, and a Teaching page that provides a detailed display for each course.. The Teaching page also provides links to class lists and course materials, ordering textbooks, access to Canvas, course evaluations, and additional campus and online resources for teaching. Grading information — a key piece for instructors — is always visible, including the deadline for submitting grades. Instructors can navigate back through six years of teaching to review previous courses. Subsequent enhancements for instructors have added an innovative course dashboard, that provides analytics about the composition of the current course, and historical courses, to help instructors adjust their instruction. As we did with the first mobile version of MyUW, we will continue to iterate and do research with users to better understand and meet the needs of instructors. Efforts to build a personalized MyUW for staff are nascent. With an institutional imperative to improve the student experience, our focus to date has largely been supporting students and instructors. In addition, we have been challenged to fully understand the way our diverse and varied staff work, and their needs and goals when using MyUW. 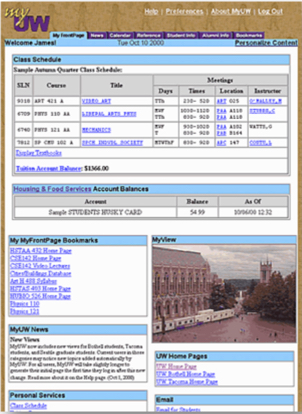 Staff now can find key tools and resources on the new MyUW, such as links to their email service, Workday, and other administrative systems, view their profile and directory information, view their library account, husky card account, manage their UW NetID and medical center passwords, and more. We look forward to enhancing MyUW for employees in the future. Just as users’ expectations have changed as the Internet has evolved, the technology stack behind MyUW has undergone significant change. From the database to the front end, the legacy MyUW has run for a long time on technologies that are now becoming increasingly risky, expensive, and obsolete. The new MyUW is built on modern technologies — from the server hardware, operating systems, to the programming languages and front-end tools that provide its clean modern look. These systems overall lower risk and cost, and make it easier to maintain and enhance the new application. The upside to these changes is that the technologies we now use afford a more dynamic, interactive, and personalized experience for MyUW users, one that will ensure that MyUW continues to support the work of everyone in the UW community.